Welcome to a Saipan Diver's Blog about Diving in the Northern Mariana Islands (CNMI, Saipan, Tinian, and Rota) with descriptions of the Dive Sites in the CNMI, information on Saipan Dive Shop Operators, Saipan Dive Boat Charter Companies, Saipan Restaurants, and Scuba Instruction. 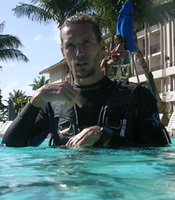 The aim is to provide as much information on diving in the CNMI in general, but most specifically Saipan, as possible. Hopefully visitors will further add to the information on this site by leaving comments. Comments will be posted and the relevant and useful ones will be incorporated in the original post if at all possible. I love your site. I really really appreciate your detailed descriptions of the dive sites. As someone that's moving to Saipan, I certainly need to learn all I can about them. It's also great that you list the dive shops and dive boats. You site looks like it's going to be a great resource for divers. I like your website especially the pictures. I recognice some of the foto's. I was on Saipan before remember. Nice divespots and klimat. I hope to dive with you soon again. Great site Richard. This is something that has been needed for a while. It is a bit hard to find all the information you provided. Great to have you aboard the blogging world. Hi Richard. Welcome to blogging. 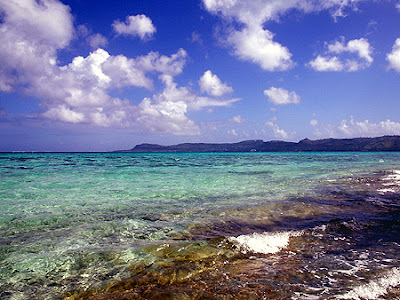 And speaking of welcomes, it looks like your site is going to be welcomed by many here on Saipan and around the world. I am going to link to you and ask that you reciprocate. Also I would like you to come over to Porky's and eat so you can add us to your surface interval list. I think you will find the food excellent and the service good too. Also we are on the beach so have a view of what you like best...water/lagoon. For those of you who do not know Richard well, I will tell you he is the only guy I know who wears out a BCD per year. This guy dives a lot and is in great demand. When he was giving me a refresher course a couple of years ago he would leave his car at home and ride his bicycle 12 miles or so up and down hills to get to the shop or dive site. I don't recommend that you try to out run this man. Diving's on my list of things to do. It's just taking a while to get back into it. Cool site! Great site. Wish we would have found it before our trip to Saipan last week. We were given your name and number by one of the Japanese outfitters, but as our trip was only days long, we didn't get around to calling. Based on all the resources on your site, we obviously missed out! Perhaps next time around. Hope you don't mind, but we linked your site with our family travelog for this year's Guam/Saipan trip. Let me know if you would prefer it removed.